Ec.Lady Mary's Silver Linnea. Today I had to say goodbye to my very dear Linnea. Sharing my life with this lovely lady and unique breeding queen for almost 16 years have been the greatest pleasure. She had a lovely relationship with her dear, Ch.Sargenta Silver Jewel until he passed away some years ago, 15 1/5 years old. 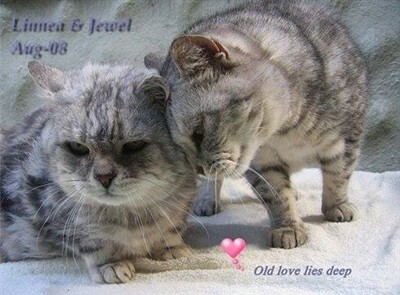 My breeding program for the silver tabby and spotted cats would not have been the same without this lovely couple. Photo taken on his last birthday, celebrating his 15'th birthday, "old love lies deep". Now they are togheter again.